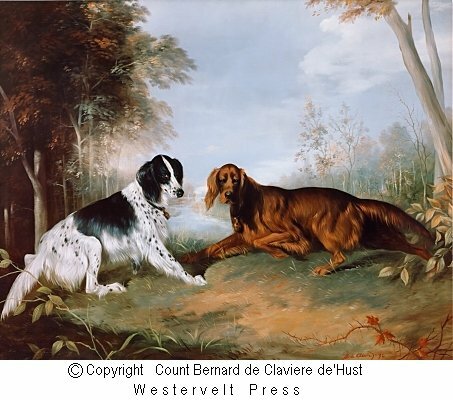 Dog Prints, English and Irish setter,Count Bernard de Claviere d'Hust," On The Set ". nature itself is at the point with him." is the English Pointer, to be a blueblood of the gun dog world. coloring did not become standard until the 19th century. was found so that a net could be thrown over both the birds and the dogs. Irish Setter have turned from the field to the bench.